Powerful RVU Ratios that are off the beaten path. One of the most common uses of RVU values is to compare physicians, peer-to-peer, by specialty within the practice or by using external industry benchmark data. In a simple sense, more RVUs equal more productivity and this simple comparison may highlight providers that are top performers versus those that may have room for improvement. Let’s dive a little deeper and explore some powerful RVU Ratios that can be obtained by combining RVU results with other practice variables such as Cost which can produce an average Cost per RVU ratio or Payments to produce average Payments per RVU. We’ve identified a list of powerful RVU Ratios that will help provide some valuable insights into Productivity, Compensation, Contract Reimbursement, E/M Coding Compliance, Cost and Profitability. Before we begin, please note that we provide a link to access the RVU files and formulas at the bottom of this article along with all the definitions and some reference notes to consider. Now, let’s start with some productivity ratios then work our way through reimbursement, cost, profitability and finish with E/M. Take a look at calculating Average wRVU’s per Work Day for each provider. It’s a consistent and daily measure of productivity which is not affected by providers taking time off or holidays. This metric trended over time paints a much better picture of a provider’s quality time seeing patients. First, you’ll need to produce a count for actual Work Days. This can be attained by counting dates of service during the calculation period. Then you take your total RVU’s and divide by the number of Work Days to end up with an average number of wRVUs per work day. You can calculate this metric per provider, facility or practice. When trended over time, this simple ratio may tell you if a provider is indeed working more or less over time. Better still, when trended against patient Visit Counts, this measure may show if a provider’s coding levels have increased or decreased. That may be an indication that the provider is seeing more or less complex patients. Another way to get a better sense of whether a provider is seeing more patients or seeing patients that may be more complex, Take the total number of RVUs and divide by the Total Number of Visits to produce average RVUs per Visit. To isolate the complexity per patient a bit further, you can take the total RVUs and divide them by the number of unique patients seen to produce a ratio of RVUs per Patient. Payments per RVU or Payments per wRVU could be considered the best of the bunch. It cuts through all the fog of fee schedules, collection and adjustment rates etc… It’s just good old dollars deposited per resource or work unit. The formula is simple enough, just take total payments and divide by RVU or by wRVU. Make sure to calculate these for each of your biggest payers and take a look at what contracts may be most profitable. Calculate total payments and total wRVU values for each of your top payers. Divide the total payments by the total wRVUs for each payer and you’ll get a payment per wRVU value per Payer. This is essentially the amount of dollars you are getting paid by that payer for every one RVU work unit. Notice the variations of each contract. If the work efforts are equal across the board, you might consider that the plans which pay you the most per RVU work unit are the most profitable. Here’s a great one that everyone can quickly put together. Take your total practice costs for a year and divide it by your total RVUs across the board and you’ll come up with Practice Cost per RVU. It’s a great number to have in your back pocket when analyzing plans and comparing Payments per RVU. Now in order to accurately calculate Cost per wRVU, you’ll need to tally up only the provider compensation costs for the year. Otherwise, the numbers will be way off the mark. Now that you’ve calculated Payments per RVU and Cost per RVU, go ahead and subtract to attain a Calculated Gross Profit per RVU. This number can tell you about how many dollars you make per RVU. You can take it a step further and calculate it separately for each of your top payers using Payer specific values for Payments per RVU. RVU’s can also be used to track coding compliance variance over time or compared among physicians. By taking your total wRVU values for all E/M visits and dividing the result by the number of units for those E/M visits, you get an average wRVU value for all E/M visits rolled up. We call this the wRVU Acuity Ratio. This value is used to quickly compare the coding levels across physicians by specialty. The higher the Acuity ratio is, the higher the overall coding is. Conversely, the lower the Acuity Ratio is, the lower the overall coding is. The calculation is a simple ratio of Work RVU values per Unit Billed for each service code group. Interestingly, the work RVU Value for 99213 is 0.97. So, in this example, we can conclude that the provider is billing at about the same work acuity level as a Level 3 visit or a 99213. We hope you enjoyed the run down of these RVU Ratios and we certainly hope that it got you thinking. 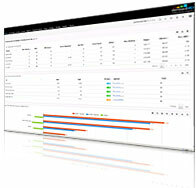 Accurate RVU analytics are tough and tedious to calculate manually but even so, they are definitely worth the effort. Once you’ve done the hard work of calculating your RVU Totals, don’t forget to take full advantage of the effort by combining the results with other practice variables to gain greater insights. Make sure to include only fully adjudicated charges and try to use a full years worth of data. The more data, the better but six months should be considered a minimum if a full year’s worth is not available. Reporting or Calculation period can be any specified time range such as a month, quarter or year. When calculating ratios, be sure to combine values from the same reporting period. Note that Visits are unique encounters and Patient Counts are unique patients. A simple method for trending is to calculate a series of monthly numbers or monthly averages and compare three or more. 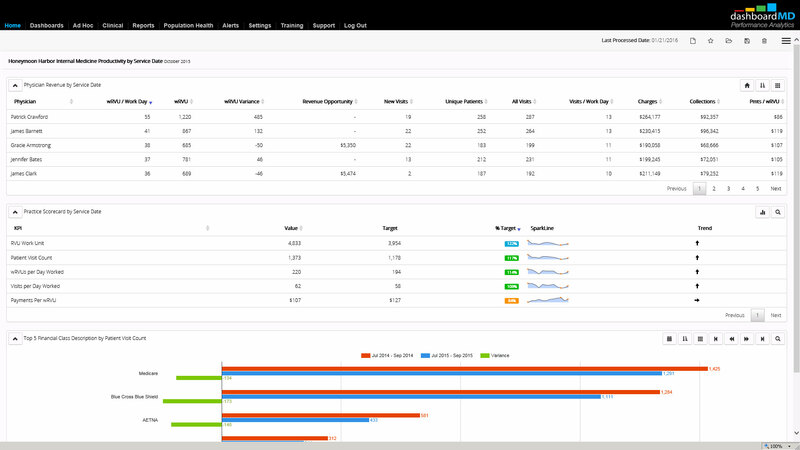 Register today to schedule a demo webinar and see our new RVU Analytics in action.